Not too long ago, connections were forged outside of technological communications and maintained via sheer will. 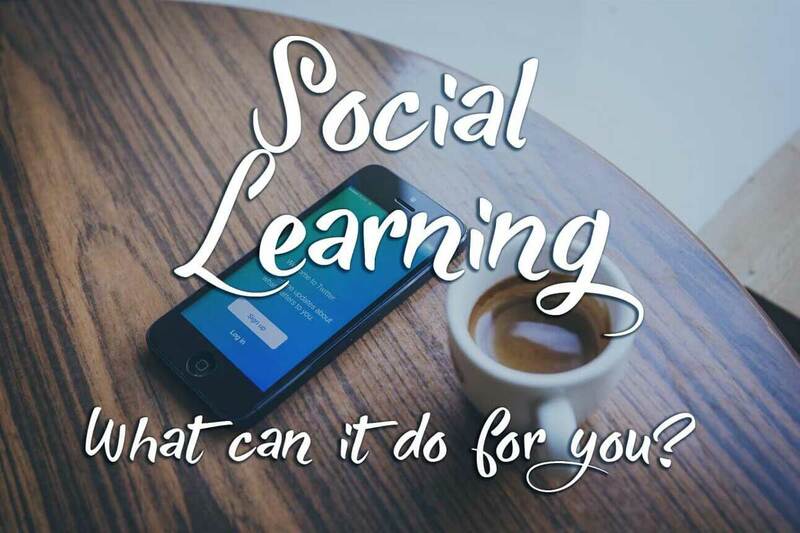 Social learning, relied solely on what one could obtain in a classroom setting, working with direct peers, or what could be conveyed back in forth on a phone. Those days are now extraordinarily a thing of the past. The World is quite plainly at our fingertips. Thanks in large part to the advent of social media, we as humans are accessible from anywhere in the world. As a result, the world is an increasingly connected and much smaller place. Instead of sitting around a campfire and playing “6 degrees from Kevin Bacon”, I could proactively comment on one of his Twitter posts and get a reaction directly from the star himself. Then, I could declare that I was only one degree away from Kevin Bacon, and most likely win the game convincingly. Why does this matter to those of us in the Training, Learning, and Development field? Social media doesn’t just close the gap between ourselves and movie stars, it also opens up a world of communication options to industry peers, thought leaders, and potential clients. This is important because it allows insights into the daily work lives of like individuals, their processes, and lessons learned on the job that can positively impact the learning community as a whole. Social Learning can best be defined as working with others to understand ideas, concepts, and procedures. In a classroom setting, this is most clearly present in projects in which group work is assigned. The goal of social learning is to pair people with different strengths and let them combine said strengths together, in order to make a pseudo-superhero. This process has been significantly augmented by social media, instead of limiting the practice to a regional endeavor where only local personnel can apply their skills, members of the organization in satellite offices can now contribute to the learning environment as a whole. In modern times, there is not a day that goes by in which I forego attempting to learn from my peers. Bloggers just like myself are sitting there tormenting their brains in an effort to say things that impact you more than the person before them. We are not here to write fluff pieces, instead, we seek solely to improve your understanding of difficult topics, keep you abreast of industry trends, and every now and then, find a way to endorse the products which we represent. Social learning done properly is unique as it provides a number of benefits not available in traditional learning environments. One of the most intriguing value offerings of Social Media in direct relation to social learning is that there is an endless stream of content being updated live, clicks away from the learner. Though not all of this content is perfect, conglomerate sites based on RSS feeds are pulling posts and ranking them so you can even abstain from reading prose that has been poorly formulated. There are even forums created for people within our industry to get together and discuss issues that they are experiencing as they happen, all of which getting archived for future generations of learners to read, digest, and implement in their daily lives. If you Google it, an answer shall appear. In order to make the most of social learning in the social media environment, it is completely vital that we correspond with one another. Social learning begins looking like regular learning if you are just reading someone’s informative “How-to” post on your social network of choice. One of the most vital components of social learning is that we are able to work together to establish a means to reach a solution. To horribly paraphrase the great Douglas Adams, The meaning of life may be 42 but that doesn’t really mean anything to you unless you know how you arrived at that answer. Make sure your social components in your learning environment adhere to this thought process. If a member of your team approaches you and says, “We need a way to turn this into a lean process. Each time a request for this particular item comes in; I panic and it takes me 3 weeks to produce the required outcome.” Then it is probably best if that particular person explains the process in which they are undergoing with someone else who has encountered the same process before. If the communication channel is opened up, the following can be quickly conveyed: “this is how the process was accomplished last time it was done, and these are the successes we have encountered while executing the process.” As a result, you are much more likely to resolve the issue of the ever extending timetable. In conclusion, a social learning program that pairs with your already in place learning objectives can improve the overall quality of the workforce. Not only will a well-adjusted program teach colleagues how to work together and utilize all of their strengths, but it will also improve their processes in the long run; shaping them as more productive individuals. Though the act of social learning has not changed too much in the grand scheme, the introduction of social media has done wonders to extend the reach of these methods, and has led to the need to re-evaluate how our programs work and are structured. I hope you have enjoyed this blog post and urge you to continue to join us here at the Gyrus Systems’ website as we further investigate relevant topics in the field, current events, and the future of our industry.